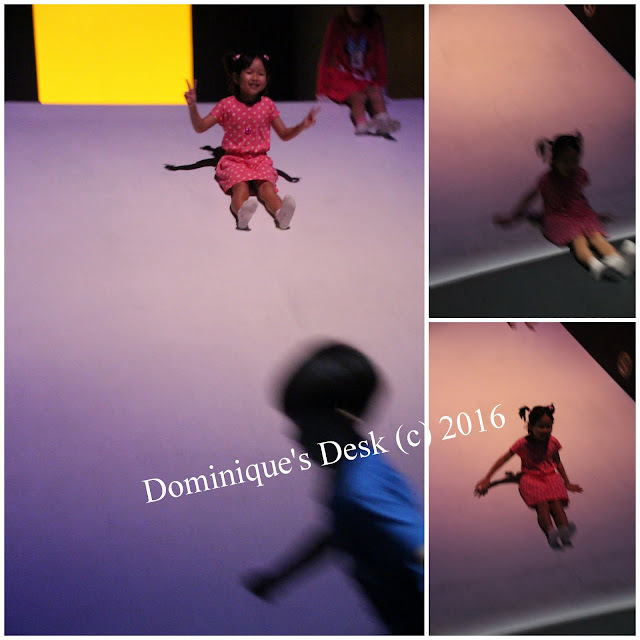 It was a really fun experience at the ArtScience Museum for us when we were there during the 1st week of the June holidays. I was really captivated by the jewels on display and took the opportunity to take some macro shots. These pins are really pretty. I love the details on it. They make for very outstanding broaches on a jacket. I guess that these “babies” will not make it to my jacket as they are certainly too expensive for me to afford. This is a piece which I personally would wear out. I love butterflies and their pretty colors. This diamond encrusted pendant would make any plain color jacket outstanding. Besides single pieces of jewellery there were also sets on display. This particular one was ruby and diamonds. It is really interesting to see how creative the designers can be with creating the pieces. I love the brilliance of this sapphire ring. The deep blue stones are accentuated by the small diamonds around it. This ruby ring reminds me of the traditional Chinese coins. The design is very unique as it has the ruby inside instead of outside on the ring. Have you been looking at Jewellery lately? If you are into Bling you will like the latest exhibition over at the Art Science Museum . The Art & Science of Gems: Van Cleef & Arpels is currently on at the museum till the 14th of August and it is certainly a visual treat for jewelry lovers. 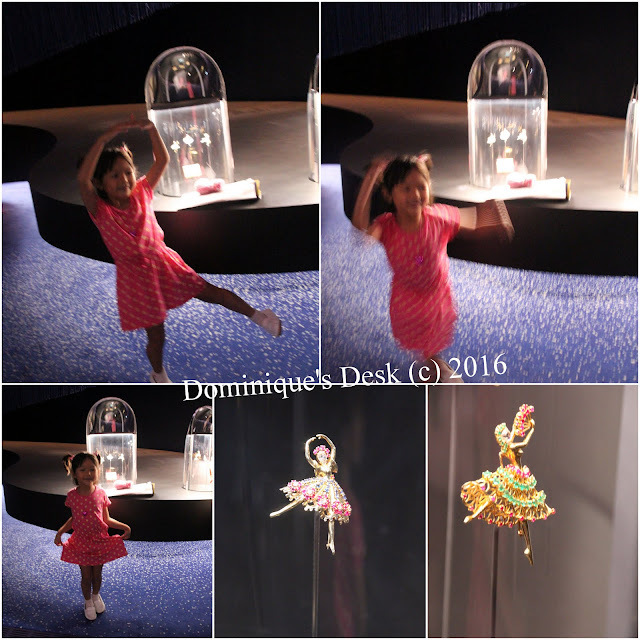 The kids were amazed by all the colorful stones and pieces of jewelry they say at the exhibition hall. It was certainly lovely seeing so many ornate pieces at the exhibition. It was not just a visual feast for the eyes as we were brought through a guided tour through the exhibition. 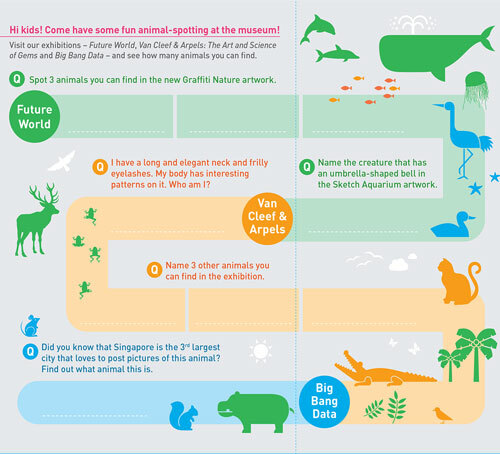 The kids were also given a fun activity booklet that lead them on an animal-spotting adventure through the museum. Tiger girl was really enthusiastic in looking out for the various different animals within the gems exhibits. Her attention was rather short lived as she got distracted when she spotted these ballerina clips. Aren’t they pretty? The kids testing the different minerals. After looking at the gems the kids were led into a room where they had a chance to use tools to examine minerals and their physical properties. A Day in the Life of a Mineralogist is an our long talk whereby the guide took on the role of a Mineralogist and gave a talk about the different minerals that were commonly used. A chart of minerals arranged by their hardness. The kids learned that the hardest mineral is the Diamond which ranged a 10 on the list. It could even be used to scratch glass. Doggie boy and Monkey boy found the talk on minerals the most interesting part of the tour as they were less then interested in looking at Gems as compared to their sister. After lunch we were taken to the Future World Exhibit. Featuring 16 digital installations, including some created especially for Future World, the exhibition takes visitors on an exciting journey of discovery through four key narratives – Nature, Town, Park and Space. There were many interactive digital exhibits at the Future World. 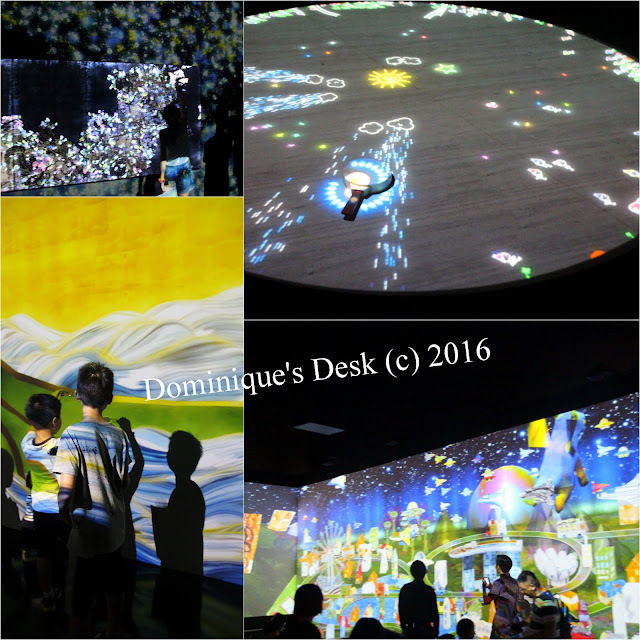 Various types of media were used to create different scenes which the kids could interact with. The slide which Tiger girl loved going down . Even thought there were many high tech gadgets and interactive station the slide was the most captivating to Tiger girl. She went down the slide countless time as she loved the adrenaline rush that it gave her. Another fun area at Future world was this ball area where kids were able to bounce coloured balls all over in the pools. It was really nice to see many pretty coloured bals being bounced around in the area. There were many art & craft areas within future one. At the Creative aquarium Tiger girl managed to bring her creation to live as a digital sea creature by putting her drawing through the special scanner after colouring it. 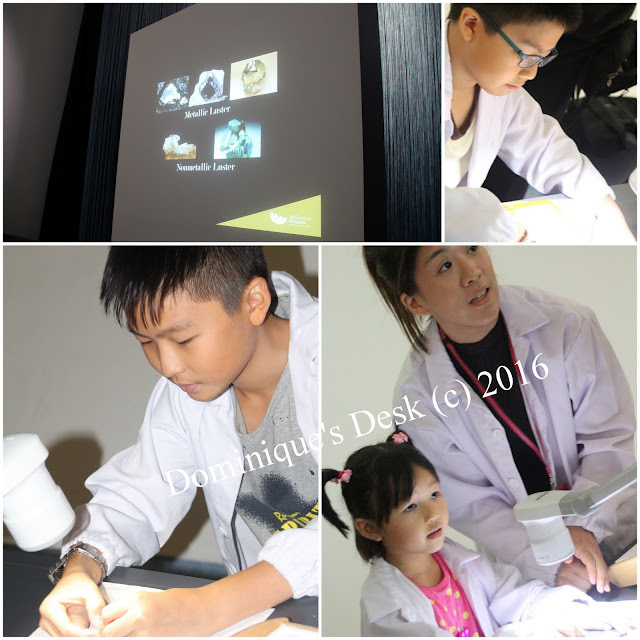 Disclaimer: We were invited to view the Exhibits as the ArtScience Museum. Opinions are 100% mine.